For four weeks from late April to early May I conducted a research survey into how things were going with the SEND reforms – specifically, how EHCPs were going. The Lamb Inquiry (2009) stated that we lacked confidence in the old system. He didn’t think that was anything wrong about the framework; Lamb was concerned about how the framework was being implemented. EHCPs are not guesswork or wish lists, they are a legal document that has a number of Statutory Duties attached to it. In particular, a range of good quality advices. Lamb said that these were often lacking in the old system and were poorly reviewed. Statements were often vague. My piece of research focused on the advices (as set out in SEN Regulation 6 (1) & (2); the SEND Code of Practice 9.69 (which relates to EHCPs being specific and quantified) and; section 19 (a) & (d) of the Children and Families Act (regard to views, wishes and feelings and, best possible […] outcomes). I asked straightforward questions – which reports were obtained, which were specific and so on. A lot of parents commented about how their assessment process went and I captured a few of these comments in my report. I may do a little more work around this aspect later as parents clearly have so much to say but – I am not a research expert and I haven’t received a single penny to do this! I wanted to do it so that parents can say if thing have moved on since the Lamb Inquiry. I may need a little bit of a break! Feel free to share it with whoever you wish, parents supplied the information so it is parents who share ownership. Like the survey, which was spread through ‘word of mouth’, if you think there are people out there who should read this, send it to them. There is a summarised version of the research report here (below) at SNJ; the long version is on my blog, or you can email me at bjpren.research@gmail.com for a copy. Great report, thanks for sharing. There is much still to be learnt from this; sadly not everywhere has undergone the culture change that Edward Timpson assumed would happen. 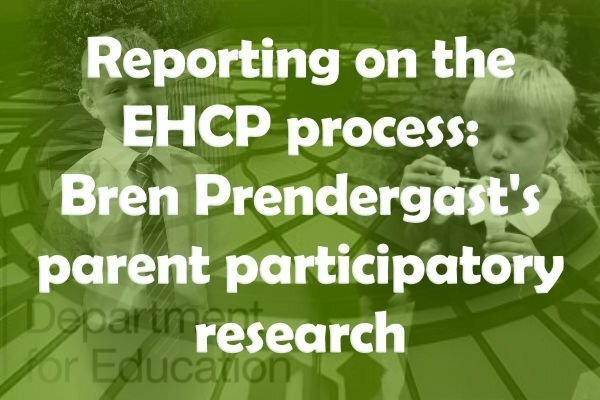 The thing is, some parents had a good sweep of reports that were specified & quantified, as was the EHCP, so it is possible. What we don’t have is effective monitoring and accountability. 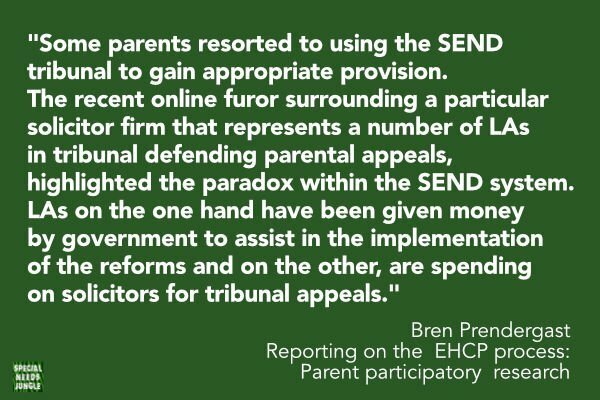 LAs defence of budgets is likely to be feeding in to their defense of parental appeals, which are the result of LAs not gaining quality reports due to defense of their budgets…. But they were given money to implement this. Arguably, this isn’t an issue with learning new law as much of it is the same, it is an issue of staffing and timescales – then we go back to the spending on appeals and the cycle gets entrenched.